(July 27, 2012) — To understand how people in the past perceived geographic space, scholars have been drawn to maps as essential primary sources. Over the last thirty years, map history has undergone a revolution in interpretation as scholars have learned to analyze cartographic images as complex representations. Thanks to the Internet and the increasing availability of digitized maps scanned by libraries and archives, it is now possible to share this knowledge and these images with a much wider reading public. Two UVa digital humanities researchers have built an innovative web tool called MapScholar to make this possible, one that has just received substantial new grant support. collections, the National Endowment for the Humanities (NEH) has awarded a three-year, $297,116 grant to S. Max Edelson, associate professor in the Corcoran Department of History, and Bill Ferster, a senior scientist at the Curry School of Education and SHANTI (Sciences, Humanities and Arts Network of Technological Initiatives). the Virginia Center for Digital History (VCDH), used their NEH start-up grant to build HistoryBrowser (now called VisualEyes) a web-based authoring tool for creating web sites that weave together images, maps, charts, video, and data into interactive visualization (See www.viseyes.org). These separate digital humanities projects came together in 2010, when Ferster and Edelson developed a prototype to MapScholar as part of the SHANTI cohort program designed to foster collaborations between UVa professors and digital humanities experts. MapScholar will draw heavily on SHANTI’s new SHIVA initiative, which provides HTML5-based visualization tools for scholars and will be released this fall. (See www.viseyes.org/shiva). 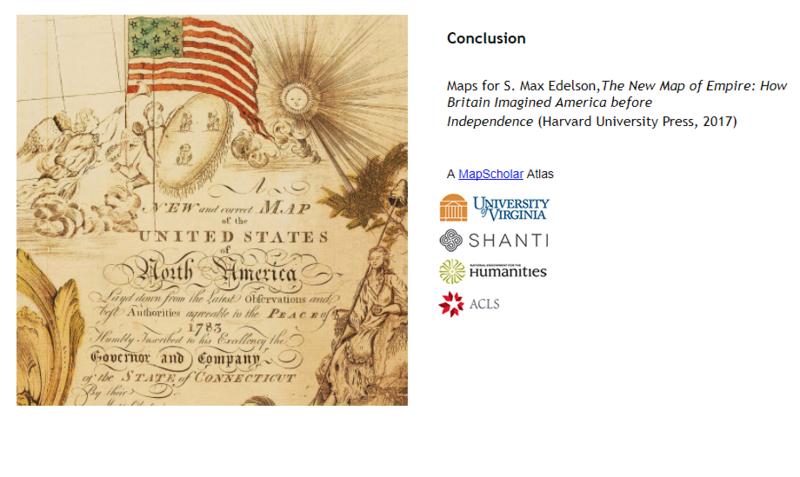 Edelson is currently writing a book about eighteenth-century cartography that will be titled The New Map of Empire: How Britain Imagined America before Independence (Harvard University Press, forthcoming 2014). Readers will be able to explore the full digital archive of more than 300 rare maps he has assembled to describe how Great Britain understood its new world colonies in the generation before the American Revolution. MapScholar is an interactive visualization tool for historic map collections. It offers an open-source portal that gives individual scholars the independent means of gathering high-resolution images, analyzing them in rich geospatial contexts, and using them to illustrate new interpretations in the history of cartography and related humanities fields. MapScholar enhances traditional books and articles by making it possible–at no cost to publishers–to mount stunning web displays of map collections assembled from libraries around the world. MapScholar’s key innovation is how it brings maps together-regardless of the archive in which they sit–for the purpose of generating new knowledge about human perceptions of geographic space. MapScholar draws on the deep institutional resources for digital humanities development at the University of Virginia, particularly those at its dedicated humanities and social sciences technology units: SHANTI, IATH, and the Library’s Scholars’ Lab and Digital Media Lab. Based on a thoroughly distributed model of data generation and storage that depends on scholars as curators of their own information, this tool can be sustained at very low costs without major institutional investments in hardware, bandwidth, and dedicated software. It joins together data in industry-standard file formats with free and effective data serving sites such as Flickr and Google Docs to generate dynamic, on-the-fly visualizations.